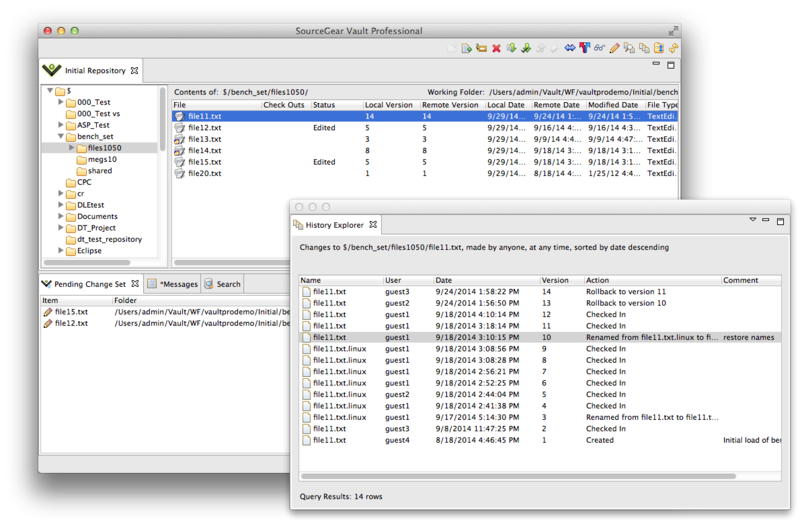 The Vault Cross Platform Client Preview 2 (Vault CPC) is a Java(TM)-based application which lets you access your Vault repositories from Mac OS X or Linux. Currently, the Vault CPC is limited in functionality to just basic source code control operations and is provided to give users a glimpse into the current state of porting the Vault GUI Client to other platforms. It has been tested on Ubuntu Linux and OS X 10.7 and greater. Vault CPC Preview 2 requires the Java JDK 7 (Mac OS X) or a Java SE 7 (Linux) in addition to a Vault 7 Server. The Official Vault Cross Platform Client edition will be included as a part of the upcoming release of Vault 8. The Vault Cross Platform Client Preview 2 edition requires the Java 7 JDK (or later), which may not already be installed on your Mac. The README (in the downloaded .dmg) contains installation instructions that will help you determine if you need to install the Java JDK.